The hubby and I are not gardeners. Ironic really, because he worked as a gardener for five years. 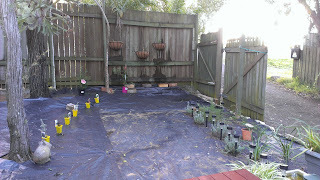 For most of the time we've been in this house water restrictions applied, and any garden that was, soon became wasn't. With our long-planned renovations steaming ahead, the garden is starting to get a little more attention. 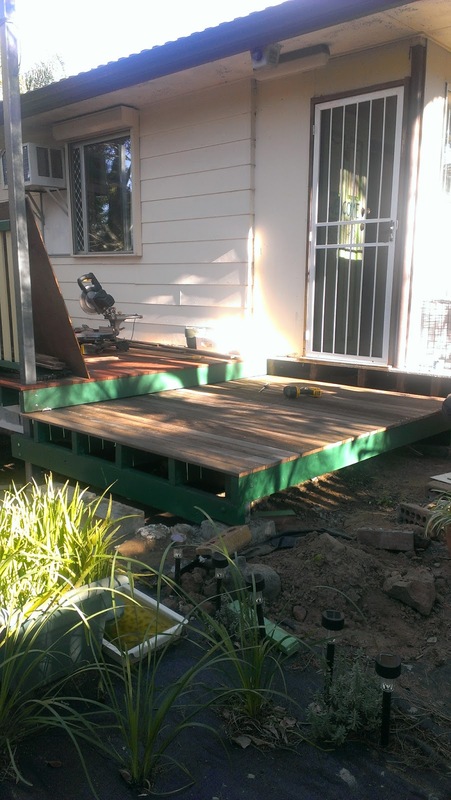 Our renovations all seem to be of the domino variety - when we do this, then we can do that, after which we can get that done. When the first domino requires massive effort (and/or cost) to get done, everything goes on hold. The front garden was waiting on the deck, the deck was waiting on ... well, I'm not sure what the deck was waiting on. Thanks to our wonderful neighbour (aka the Energiser Bunny on Steroids) the decks (yes, two) are now complete. 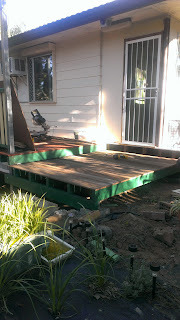 The lower deck requires steps - one on the side (right hand side of the photo) and three on the front (left hand side of the photo), but otherwise it's now complete. This means I know where the paths needs to go in the garden, so I know where I can plant stuff. 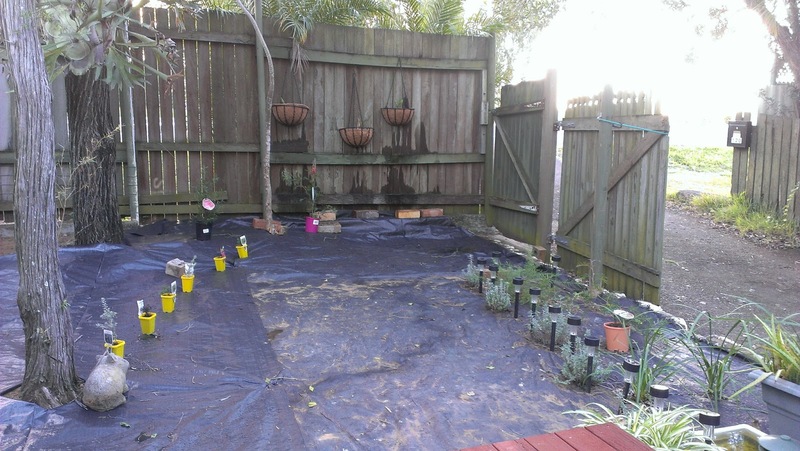 Yesterday and today I cleared, weeded, levelled and weed-matted the garden from the deck to the fence. I bought plants for hedging row for the path and a couple of fillers.The section of garden in the foreground of the photo above is planted and coming along so-so. I'm hoping for a growth spurt in everything in spring. The rest of the front garden is either bare dirt or weeds, with just a couple of 'stayers' (plants that I intend to keep). 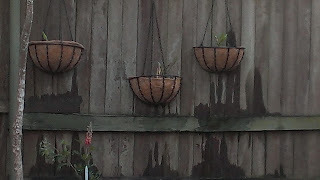 While clearing I found three pots of orchids, which I placed (very carefully) at the base on a tree about 18 months ago. I have since completely forgotten about them; absolutely ignored them. They were from my nana's collection, so I was very pleased to re-discover them today and to discover that they appear to be alive. 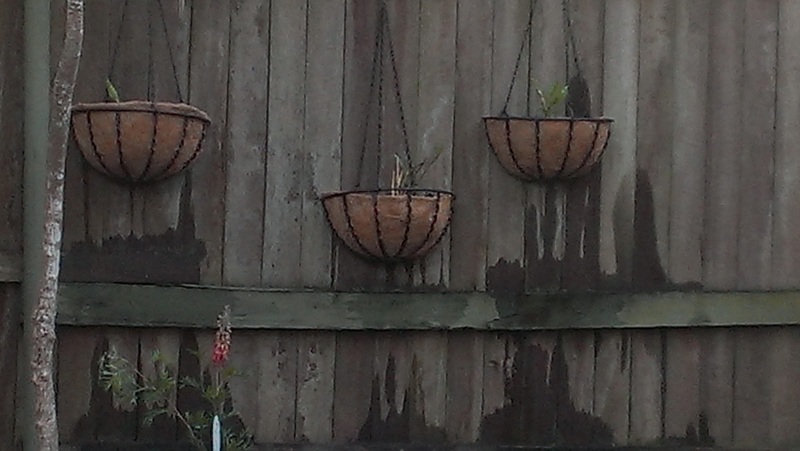 I have repotted them in hanging baskets on the fence. I wouldn't be at all surprised if they die of shock from being tended to. One of them had nearly no potting mix/dirt in the pot at all. Although, it actually looks the healthiest of the lot. The current view from our deck. Starting to look like a real garden. No creative journal entry today. The challenge was to take a five minute walk and create something with what you find in the area. I haven't taken any walks today. Maybe tomorrow I'll take a five minute walk from the garage to the garden with a bucket of mulch.